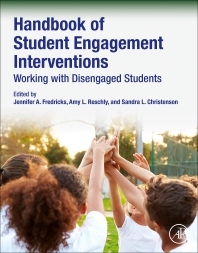 Handbook of Student Engagement Interventions: Working with Disengaged Students provides an understanding of the factors that contribute to student disengagement, methods for identifying students at risk, and intervention strategies to increase student engagement. With a focus on translating research into best practice, the book pulls together the current research on engagement in schools and empowers readers to craft and implement interventions. Users will find reviews on evidence-based academic, behavioral, social, mental health, and community-based interventions that will help increase all types of engagement. The book looks at ways of reducing suspensions through alternative disciplinary practices, the role resiliency can play in student engagement, strategies for community and school collaborations in addressing barriers to engagement, and what can be learned from students who struggled in school, but succeeded later in life. It is a hands-on resource for educators, school psychologists, researchers, and students looking to gain insight into the research on this topic and the strategies that can be deployed to promote student engagement. Jennifer Fredricks is the Dean of Academic Departments and Programs and Professor of Psychology at Union College. She has published over 50 peer-reviewed journal articles and book chapters on motivation and engagement in school and out-of-school contexts. She is author of Eight Myths of Student Engagement: Creating Classrooms of Deep Learning (Corwin Press). She served as the William T. Grant Distinguished Fellow and Students at the Center Distinguished Fellow. She has received funding from the National Science Foundation, American Educational Research Association, Spencer Foundation, and Institute for Educational Studies to support her research. Professor and Program Coordinator, University of Georgia, Department of Educational Psychology, School Psychology Program. Her areas of expertise include engagement and dropout prevention, working with families and schools to promote student success, and curriculum-based measurement and problem-solving. She is the editor of The School Psychology Review and on the editorial boards of Journal of School Psychology, Journal of Psychoeducational Assessment, and Journal of Early Intervention. She co-edited the Handbook of School-Family Partnerships and the Handbook for Research on Student Engagement. Professor Emeritus, University of Minnesota, Department of Educational Psychology, School Psychology program. Recipient of the Lightner Witmer Aware from the American Psychological Association for early career contributions to the field of school psychology and the Senior Scientist Award from APA for recognition of a career-long significant program of scholarship representing outstanding contributions to the knowledge base of school psychology. Her research focuses on interventions that enhance engagement at school and with learning for marginalized students with and without disabilities. She is particularly interested in the identification of family and school factors that facilitate student engagement and success in school and postsecondary readiness. She has been a principal investigator on several federally-funded projects in the areas of dropout prevention and family-school partnerships, including Check and Connect, which is in its 26th year of research. She is the co-editor of Handbook of School-Family Partnerships and Handbook for Research on Student Engagement.